Hi! Thank you so so much for stopping by to see my very first post on this new platform! This post has been over a month in the making because I wanted to get it just right before I put it out into the internet for you all to see. So let us get into it! A few things that catalyzed the recipe for this blueberry crumble were my transition into a gluten-free way of eating and going blueberry picking in June. This summer I stopped eating gluten because of some weird symptoms I've been having. Needless to say, it's been a pretty smooth transition with the abundance of gluten-free options available nowadays. I'm not suffering by any means. The second thing that sparked the creation of this dessert was the pounds of blueberries we picked this summer. Gabriel and I woke up early to go blueberry picking twice! That's how dedicated we were to get some fresh berries and also how serious I was about stocking up. The hard work was well worth the pounds of blueberries picked, and the experience was a trip down memory lane. 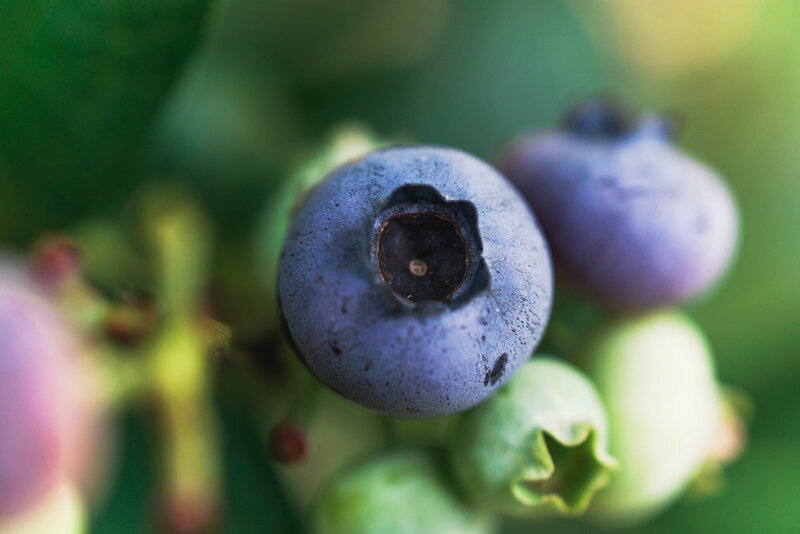 Growing up, my mom would take my siblings and I blueberry picking in the summer. We would go out early in the morning and come back with gallons of blueberries. I would eat my weight in blueberries, straight off the bush. We could easily go through all of the blueberries we picked, but my mom would try to freeze some for later, and she always made a blueberry pie. This summer was the first time I have been blueberry picking since I was a kid, and I must say, it was a lot more work than I remember. We stood in the sun, picking blueberries for hours. By the end, we were rewarded with a bounty of berries and the hard work had paid off. I knew I wanted to make some sort of dessert with all of the berries we picked, but my options were slightly limited because of the no gluten thing (no pie like the good ol' days). So, I did a google search for "gluten-free blueberry crumble." I wasn't very impressed with the options, so I decided to use the recipes as a guide and make it my own. I put my own spin on the classic crumb topping and decided to use buckwheat, which is gluten-free. I also swapped out nuts for sunflower and pumpkin seeds because Gabriel is allergic to nuts. The combination of buckwheat and seeds added a nice crunchy texture and nutty flavor! I actually prefer it over the traditional crumb topping that most crisps have, because of how hearty it is. I combined the sugar, lemon juice, blueberries, and tapioca starch on the stove top to ensure each ingredient was combined evenly throughout. Cooking on the stovetop also gives the filling the perfect consistency, gooey and but not too runny. Honestly, I surprised myself with how good this turned out. The flavor is the perfect balance of tart and sweet with a nice crunchy texture from the buckwheat and seeds. It was so good that Gabriel and I finished the 8x8 pan in two days! I think that is a testament to how freaking good this crumble is. Another bonus to this dessert is that it complies with most dietary restrictions, making it perfect to bring to any gathering. It is gluten-free and nut free, and most likely can be vegan if you substitute coconut oil for the butter. Feel free to use this recipe as a base for any fruit crumble! I think it would be delightful with cherry, apple, or peach. Enjoy! Combine buckwheat, sunflower seeds, and pumpkin seeds and then spread on a baking sheet in an even layer. Toast the buckwheat and seed mixture for 10 minutes in the over. Let cool while making the blueberry filling. Reduce the oven heat to 350 F.
If using fresh blueberries, rinse and remove any stems. Add blueberries and lemon juice to a medium-sized pot and stir together. Bring the pot of blueberries on the stove to medium heat. Add the sugar and tapioca starch, stirring gently until blueberries are coated. Continue cooking, stirring frequently. The blueberries should burst open and for a sauce. Remove from heat when the blueberry sauce thickens, should take about 10 minutes. Pour the blueberry filling into the bottom of an 8x8 square dish. In a separate medium-sized bowl, combine the topping ingredients: toasted buckwheat, sunflower seeds, and pumpkin seeds, brown sugar, gluten-free flour, cloves, cinnamon, salt, and cold pieces of butter. With a pastry cutter or two forks, cut the cold butter into the mixture until everything is well combined and there are no large chunks of butter remaining. Sprinkle the topping over the blueberry filling in an even layer. Bake for 20 to 25 minutes on 230 F. When the blueberry filling is bubbly around the edges, it is done. Remove the crisp from the oven and let cool for 15 minutes.